Tonight, ChiIL Mama will be ChiILin' in Chi, IL with one of our favorite storefronts, The House Theatre of Chicago. We were already reviewing elsewhere for the UNITED FLIGHT 232 press opening on 3/20, and the buzz about this show has been great. Can't wait to see for ourselves! Check back soon for our full review. The House Theatre of Chicago is proud to announce the world premiere adaptation of Laurence Gonzales’ book Flight 232, adapted and directed by Vanessa Stalling. United Flight 232 tells the story of the harrowing July 19, 1989 flight bound for Chicago’s O’Hare airport. 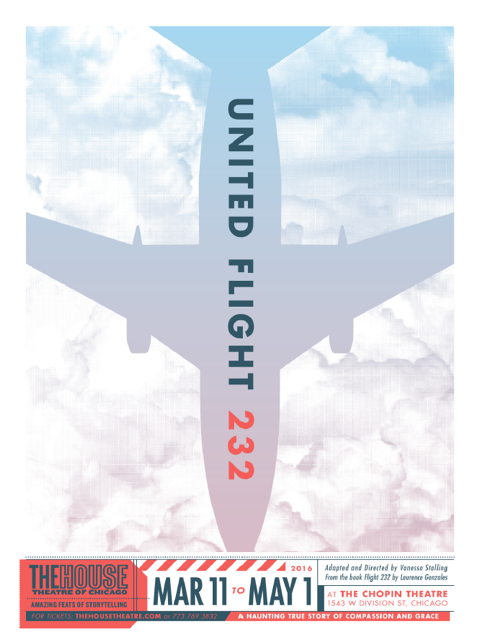 United Flight 232 runs through May 1, plays at Chopin Theatre’s Upstairs Theater, 1543 W. Division St. Regular performances are Thursdays, Fridays and Saturdays at 8 p.m. and Sundays at 7 p.m., from March 25 – May 1. Regular run tickets range from $30 to $35. $10 same-day tickets for students and industry professionals are available for all dates, seats permitting. For more information and to purchase tickets, please visit www.thehousetheatre.com or call 773.769.3832. The House was founded in 2001 by a group of friends to explore connections between Community and Storytelling through a unique theatrical experience. Since becoming eligible in 2004, The House has been nominated for 60 Joseph Jefferson Awards (21 wins), became the first recipient of Broadway in Chicago’s Emerging Theater Award in 2007, and was awarded a 2014 National Theatre Company Grant by the American Theatre Wing, founder of the Tony Awards. Now in its 14th year of original work, The House continues its mission to unite Chicago in the spirit of Community through amazing feats of Storytelling.